Michael Owen has heaped praise on the current Reds side. 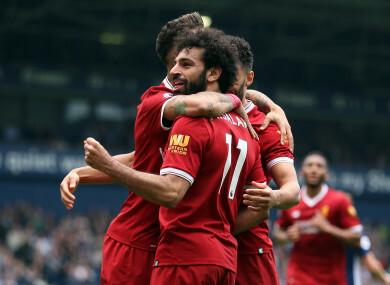 Liverpool's Mohamed Salah (centre) celebrates scoring. EX-LIVERPOOL STRIKER Michael Owen believes the Reds’ current side are superior to the team that won the Champions League in 2005 and feels Jurgen Klopp’s men are good enough to beat Barcelona’s conquerors Roma. The English side take on their Italian counterparts at Anfield tonight in the Champions League semi-final first leg, before the return fixture at the Stadio Olimpico on 2 May. While the Serie A outfit should not be underestimated as their surprise quarter-final defeat of Barcelona illustrated, Owen is confident his former side will prevail ultimately. “It’s been a lovely draw,” he tells The42. “You couldn’t have asked for a better team than Roma. “In saying that, they’re going to be difficult to beat. I don’t think they’ll play like an expansive team. I don’t think they’ll play into Liverpool’s hands in that way. “That’s where Liverpool have possibly struggled in the league, trying to open a packed defence up. They tend to like it against the better teams that come out and play. They like to nick the ball and break. But I think it’s been a brilliant campaign. “If you put a gun to my head and said ‘name one team that are going to get into the final,’ I’d be saying Liverpool, they’ve got to be the favourites with the draw. Liverpool have a rich history in Europe’s elite-club competition. Only Real Madrid (12) and Milan (7) have won the European Cup/Champions League more often. Should they triumph this year, it would be the sixth time they have lifted the trophy, meaning they would surpass the number of wins (5) they currently share with both Bayern Munich and Barcelona. The last time Liverpool tasted silverware in Europe was a particularly memorable occasion. Having been 3-0 down to Milan at half-time, they produced a miraculous comeback to make it 3-3 before winning on penalties. And while that team contained top players including Steven Gerrard, Jamie Carragher and Xabi Alonso, Owen believes the current crop of stars are better. I think they’re much better than the Champions League-winning team. I was on BT Sport with Steven Gerrard the other day and he was obviously on that team, but even he admits this team would have given them a good thrashing. Owen scored 158 goals in 297 appearances for Liverpool and is widely regarded as one of the club’s greatest ever goalscorers. One contemporary player who is on course to enjoy a similarly spectacular Anfield career is recently crowned PFA Player of the Year, Mo Salah. The Egypt international has enjoyed a phenomenal 41-goal debut season, after signing for Liverpool from Roma in the summer for an initial €42 million fee. Owen, however, insists Salah must maintain this form for a longer period of time before he can be considered a club legend. “If he never played another game for Liverpool, I don’t think he would go down as a great, because he’s won nothing and he’s scored a lot, so he certainly has to continue what he’s doing for another couple of years, when you bear in mind some of the greats who have played. “But the problem is everyone remembers him from his Chelsea days when he was quite lacking in confidence and didn’t have an end product. He was just this quick lad who scared defences with his pace, but now he’s added so much to his game and is obviously the full package and getting better and learning on the job as well. Even if Liverpool don’t triumph in the Champions League and perform poorly in the remaining domestic games, Owen feels it should be considered a successful season regardless. “You always want to have something to show for your performances. I’m always reluctant to just go off what you win if there’s progress, because it’s not always a perfect barometer. You just need to use your eyes. “If Liverpool lose every game between now and the end of the season, there’s still no question that this Liverpool team is very good and it’s definitely getting better and performance-wise, it’s been a very good season no matter what they win. It’s the icing on the cake if Liverpool can win the Champions League and qualify for the top four, it’s absolutely brilliant and I’d say the same for Tottenham. They still look as if they’re on an upward trajectory. They’re not going to win anything this year. They came second last year and they’re coming third or fourth this year, but I still think the new stadium they’re moving into, another year of consolidation, a decent enough run in the Champions League, it’s more experience for an inexperienced team and an inexperienced club at European level. So I think Tottenham, Liverpool and Man City are certainly teams on an upward trajectory. “You could question the others. Arsenal you could say are on a downward spiral and have been for 10 years, Chelsea’s defence of the title has been very limp. They’re not going to get into the top four. If you said to them at the start of the season, you’re going to win the FA Cup and come fifth in the league, bearing in mind where they were, they’re not going to take that, and that’s at the very best. So I think they need to reverse their downward trend at the minute, and then Man United are another arguable one in a way. “If I’m using my eyes, I don’t think there’s loads of progress [at United], I think they can get far better for the players they’ve got. But at the end of the year, you might look at it and see they’ve won trophies again. Despite Owen looking at Tottenham’s season in a more positive manner than United’s, the Red Devils still managed to prevail against Mauricio Pochettino’s side last weekend. Spurs extended their FA Cup semi-final losing run to eight consecutive games, last reaching the final when they won the competition in 1991. And Owen believes teams’ culture of success or failure can have a psychological impact on the players in question. “I think the badge plays a big role in football in general,” he explains. “If you’re wearing a certain badge or going to a stadium that’s steeped in history, you’re well aware of the task and the history behind it. “The hardest thing is to win your first one, to break that losers’ mentality, that ‘nearly’ mentality. I think Tottenham will win a trophy soon and that will make them believe a bit more. “They played against Juventus [in the Champions League] and they were probably the best team for 160 minutes out of 180 and they still lost, and that is just pure experience. “It was like when Paris St Germain played Real Madrid. Madrid just totally out-experienced them. When it comes to the big games, the big players, the ones with experience just have that extra nous, extra gear. They know how to stay in games when they’re struggling and not go too far behind. It’s like a tennis player I suppose, you keep getting beat on the baseline, what are you going to do? You’ve just got to change it, even if you’re not as good at the net, change it. “You change the course of a game somehow or stay in a game or find a way somehow. The inexperienced teams have one way of playing and think it’s just about ‘out-score, outscore, out score’. Former Premier League player Michael Owen was in Dublin on Sunday to attend an exclusive event hosted by Cadbury, ‘Official Snack Partner’ to the Premier League. Hosted in The Chocolate Factory in Dublin, Michael was joined by Supervalu and Centra competition winners from all over the country as they enjoyed a meet and greet with the football legend along with a questions and answers session and enjoyed a live Premier League game. The 2017/18 season marked the first year of Cadbury’s three-year partnership. Email “'They're much better than the 2005 Champions League-winning team... Even Steven Gerrard admits it'”. Feedback on “'They're much better than the 2005 Champions League-winning team... Even Steven Gerrard admits it'”.